Watch a young child playing and you will notice how much they move their body. Children will walk, run, sprint, lift, squat, jump, climb, and stretch; all of the things we pay a personal trainer to tell us to do! The children are doing it because they enjoy it! Play is a form of exercise for children AND parents. During play, children are usually laughing, smiling, encouraging each other, sweating, and high fiving each other when they accomplish something together. These children are exercising and moving their bodies, but to them they are just playing and having fun! When we play with our children, we not only reap the benefits of exercise, we also form a stronger bond. Children need and want to move. As parents and child care providers, we must provide children with opportunities to move. Children are action-orientated and like to be challenged mentally and physically. Movement promotes physical fitness and the enhancement of a positive self-image, self-confidence, creativity, and self expression. Movement has also been proven to stimulate the learning process. Early motor development has been recognized by physical educators and human development specialists to be one of the most important factors in the optimum physical, mental, academic, and overall development of your child. We are all aware of the increase in childhood obesity in Prince William County. Obesity can lead to numerous health issues. By encouraging movement and increasing opportunities available to our young children they will naturally develop an enjoyment of moving their bodies and gain self confidence to accomplish anything in school and life. Bicycle baby’s legs and arms gently to stretch out large muscles. Afterwards, lay baby on back and do push-ups, give baby a kiss for each one completed. Supervised tummy time helps back and neck strength for the baby. Lie on your stomach beside the baby; arch your back and move arms and legs like a swimmer. Hold older baby up and encourage them to jump up and down. Use your biceps to lift baby higher and lower gently to work your arms. Use a large ball to kick around with your child. “Race” your child to get the ball. Place child’s favorite doll/toy in a wagon and have child pull. Walk beside wagon. Have an ‘aerobics class’ with your toddler. Turn on music and stretch, jump, and dance. Your toddler will imitate your movements. Play Monkey See, Monkey Do utilizing different arm and leg positions, bending activities and other body movements. Have your child throw balls or bean bags into a laundry basket. Play a simple game of Follow the Leader through an easy obstacle course, using small blocks or chairs to step or climb over. Use the entire room. Have your child toss bean bags or balls into a box while pretending the box is a mouth of an animal that you are feeding. Set up an obstacle course with streets and bridges to go through, over, and under by driving their imaginary car, bus, or train. Play imagination games where you ask your child to be different things such as an airplane, popping popcorn, a floating balloon, frog, and various animals. Demonstrate when necessary but encourage your child to use their imagination. Have your child move to music use movement words such as: run, gallop, hop, skip, spin, twist, jump, and roll. ‘Freeze’ when the music stops. Give your child a balloon and challenge them to keep it up in the air and not let it hit the ground. Volley the balloon back and forth to each other. Provide a tumbling mat or carpet area where they can perform somersaults and other tumbling exercises. Get moving – you and your child will have FUN! Kathy Harju and Christy Moore recently opened their own child care center, Above & Beyond Child Care, in Manassas. While working together for Prince William County supervising children’s programs, they both realized they had the same dream of opening their own center. 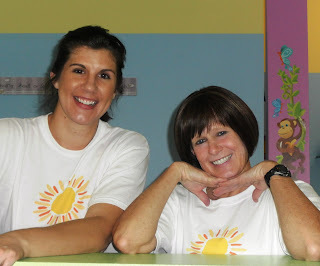 Kathy and Christy have the same positive, energetic approach to working with children and enjoy it immensely. They have a combined total of 45 years of child care experience. They are looking forward to serving the Manassas area and would love to meet you and your child!